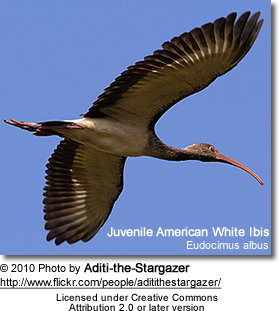 American White Ibis (Eudocimus albus) is wading bird of the ibis family Threskiornithidae. 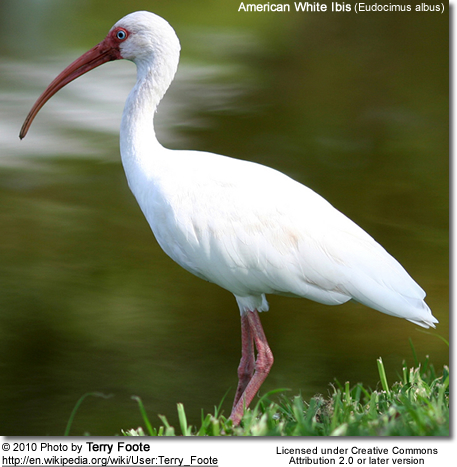 The American White Ibis is known to hybridize with the Scarlet Ibis, and these two species are sometimes considered conspecific (one and the same species). Ibises resemble herons and share many of their habitats and behavioral traits, but unlike herons, ibises fly with necks outstretched and often in V-formation. The American White Ibis occurs naturally from the mid-Atlantic coast of the United States south through most of the New World tropics. It occurs in marshy wetlands and pools near the coast. It also occurs on mowed grass, lawns, and has become common in some city parks, where it can be found feeding alone or with other Ibis. 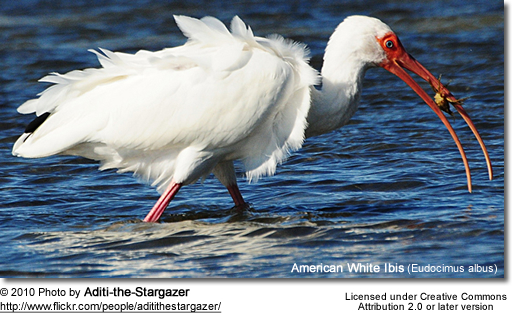 Adult American White Ibises measure about 65 cm in length and have a 95 cm wingspan. They have all-white plumage except for black wingtips (visible in flight) and reddish bills and legs. The red bill blends into the face of breeding birds; non-breeding birds show a pink to red face. 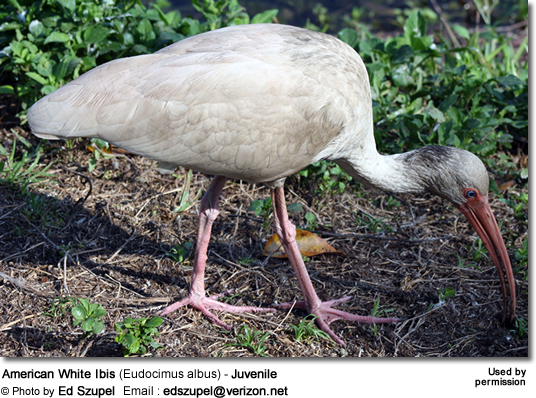 Juveniles are largely brown with duller bare parts; they are distinguished from the Glossy and White-faced Ibises by white underparts and rumps. Over all both sexes look alike. 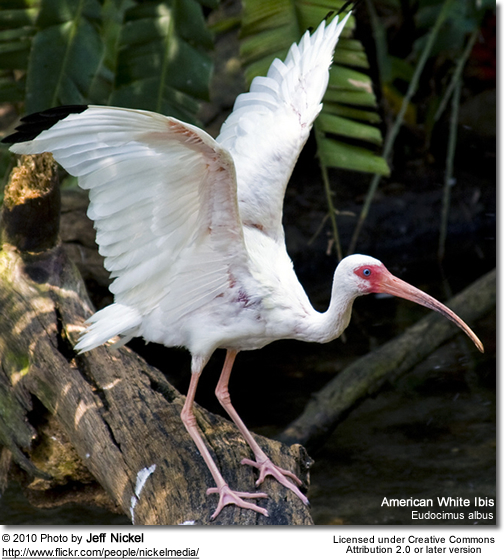 Like the other species of ibis, the White Ibis flies with neck and legs outstretched, often in long, loose lines. The song of the male is described as hunk-hunk-hunk-hunk. It builds a stick nest in trees, bushes, or over water, and 2 to 5 eggs are typically laid. 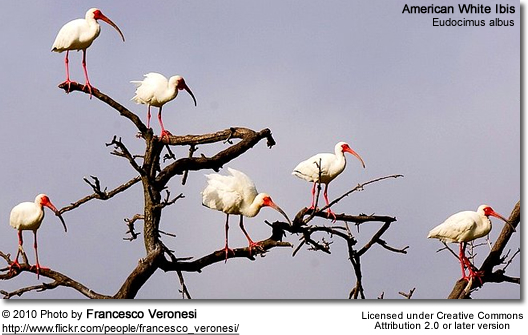 White ibises are monogamous and colonial, usually nesting in mixed colonies with other wading species. This ibis feeds by probing with its long, downcurved beak. Its diet consists of various fish, frogs and other water creatures, as well as insects and small reptiles. 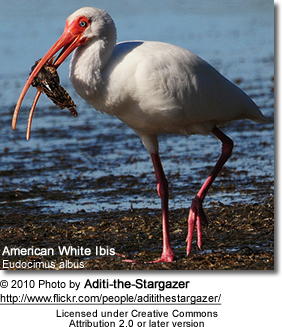 Ibises mostly feed in shallow waters on aquatic insects, mollusks, frogs, and food sifted from the water surface. Their diet also includes insects caught on land, as well as lizards, worms, skinks, and other small reptiles. Some species will also take small birds. Most breeding activities are observed after the rainy season, when plenty of food is available. They typically nest in colonies, often with other water birds. The average clutch consists of 2 – 4 eggs. The nests are often reused year-after-year.